80% Pure vegan protein in a powder! It's popular with bodybuilders and anyone looking to boost their protein intake. Rice Protein Powder mixes well in smoothies and can also be added to porridge and even pancakes! 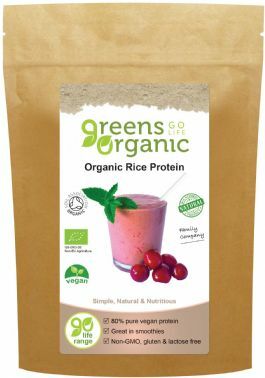 This Organic Rice Protein Powder is made from whole grain brown rice, and is a natural, organic alternative to both whey and soy protein powders. It's especially useful if you're exercising, or for vegetarians and vegans wishing to increase the protein in their diet.